Join us for this hilarious, interactive dinner theater featuring the Lancaster Regional Players! Guests will be a part of the antic-filled Polish wedding and reception, including dancing the Polka, a bouquet and garter toss, and more! This event includes a huge theme basket raffle, special raffles, cash bar, dinner and, of course, wedding cake! Tickets are $43 per person, $325 for a table of 8 or $400 for a table of 10. 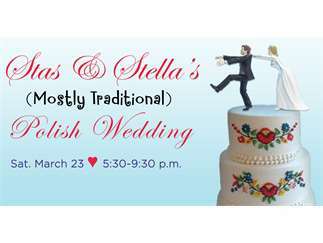 Purchase tickets by calling sasi's Development Department at (716) 805-1555 or through our website: http://www.sasinc.org/Events/stas-and-stellas-mostly-traditional-polish-wedding. All proceeds benefit individuals with disabilities who receive supports from sasi.